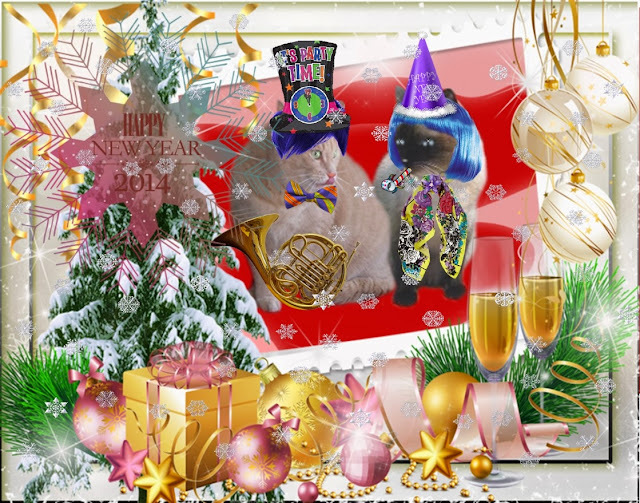 Wendy's 3-D Cats: A 3-D HAPPY NEW YEAR TO ALL! The 3-Ds are, once again, with their respective significant others on this special occasion. Dylan and Halle were in Ottawa at a New Year's Eve party, and are returning to our home for the night. They sure like to make lots of noise. Halle's got a normal-sized noisemaker, but Dylan's got a French horn! He's just wetting his lips before blowing efurryone away with his mewsical interPURRtation of "Auld Lang Syne". He could get a Grammy for that! Domino and her Milo are celebrating the arrival of 2014 in NYC. 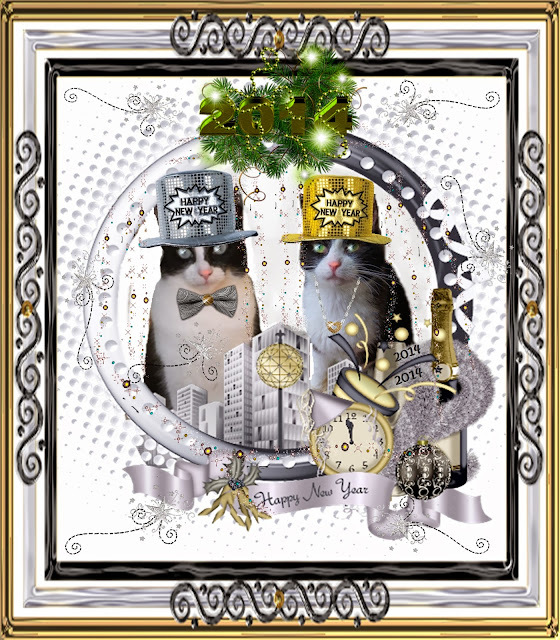 They have a room at a PURRestigious hotel and are enjoying the festivities from their penthouse window. They would like to throw confetti, but all they can find is toilet paper. Oh well, at least they're having a ball shredding it! Getting it out the window is something else. And there's lots more where that came from, too! And to see what Dante and Sascha are up to, go and see "All About Lacocoon Dante". But before you're off let me, too, wish you a very happy, healthy and PURRosPURRous New Year!